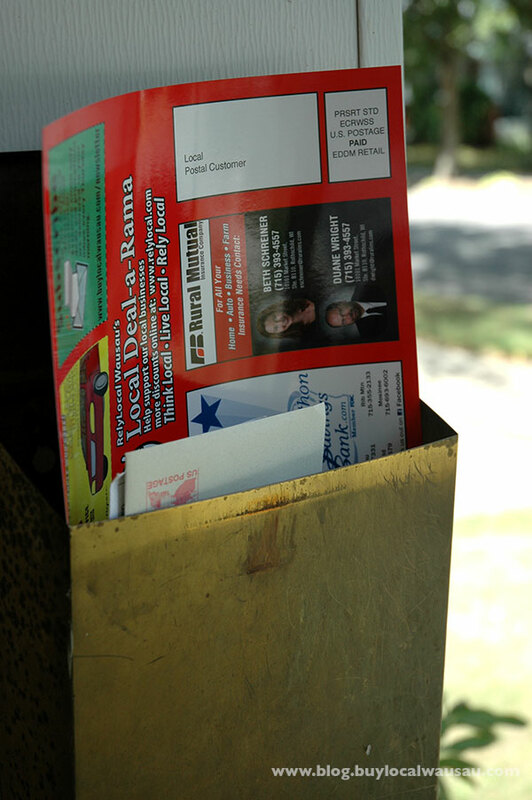 Direct Mail advertising still works! 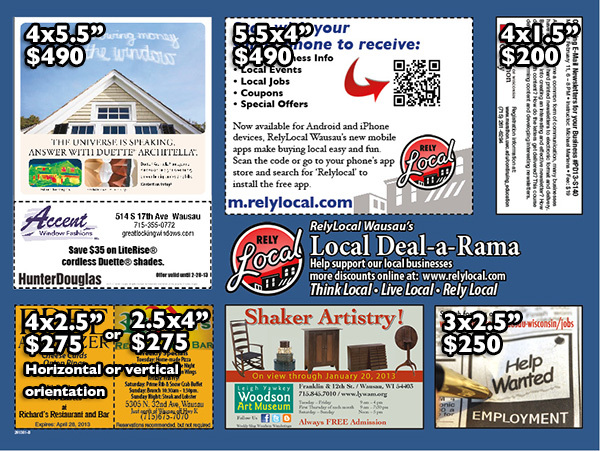 The Local Deals Postcard is a cost effective way to make it work for you! Direct Mail is still a great way to get your message out. Every household receives mail. Would you like to get your message to 5,000 local residents for about a nickel a piece? With RelyLocal’s Co-op Advertising package, that’s possible. 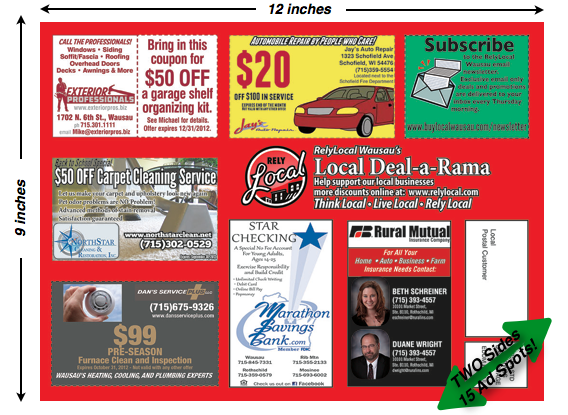 Your ad will be on a large 9×12 inch postcard; the largest piece of paper that can be mailed. Your message is guaranteed to be read as their is no envelope to open. Every advertisement is in plain view on the jumbo two-sided card. Lock out your competition: only one business category allowed on each card. Limited number of ad slots: 15 total advertisers per card. 7 on each side. 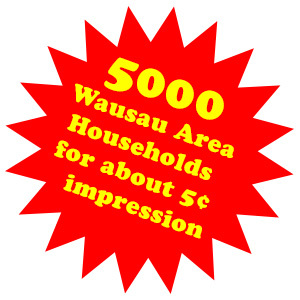 Instant branded recognition with the RelyLocal Wausau name. Cards are mailed to targeted, affluent neighborhoods interested in your message. The card is so big, it can’t be missed. It becomes the outside wrapper for the rest of the mail. Spaces are limited. Reserve yours today. 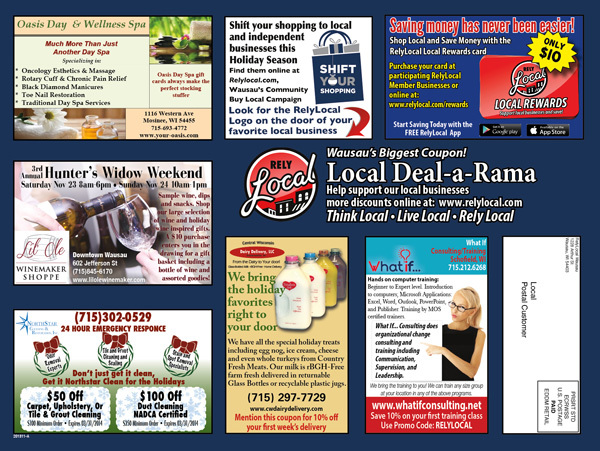 The RelyLocal Deal-a-Rama Postcard creates results! The RelyLocal Wausau Postcard is unique, no other mailpiece like it is being sent out in the Wausau area. Advertisers on the card have seen positive benefits and have recouped their investment several times over. RelyLocal will consult with you to help create an advertisement and offer that generates results. No setup fees! No Design fees! No artwork fees! Don’t have an ad? We’ll create one for you. We’ll design an ad for you if you don’t have one available. Otherwise please submit a 350dpi CMYK JPG, PDF, PSD, or INDD file. This card needs to be seen to be believed. Call Michael at (715)203-1240 or use our contact form to receive more information and a free sample card. Or just call to reserve your spot today!